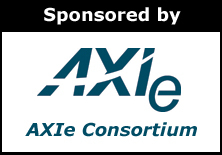 Welcome to the September 2014 issue of the AXIe Newsletter. Our AXIe Consortium LinkedIn membership numbers continue to increase and we are now a community of over 330 members. Whether designing operational radar and EW (electronic warfare) systems, or testing the associated LRUs (Line Replaceable Units) after deployment, a testing team is often challenged to accomplish the tasks using COTS (Commercial Off-the-Shelf) test equipment. Until recently, the advanced nature of the signals and the lack of a high power modular infrastructure made this a nearly impossible goal. Thanks to AXIe® (AdvancedTCA® eXtensions for Instrumentation), this is no longer the case. AXIe is a high performance modular system that is based on LAN and a high speed PCIe® backplane. Like PXI®, It is an open system, which allows a user to mix and match modules from various vendors to create the test system of their choice. The COTS requirement is met by acquiring modules, chassis, and software from commercial vendors. AXIe supports up to 200 watts per slot. This, coupled with a board area and module volume that is several times that of PXI, makes it an ideal platform for addressing high performance testing applications. In the software domain, AXIe systems act like PXI systems, leveraging the same software. Therefore, familiar software products such as Microsoft Visual Studio, National Instrument LabVIEW®, or MathWorks MATLAB® easily work with AXIe systems. This paper will present example AXIe systems configured to address radar and EW applications. It is useful to note that there are generally two classes of measurements- receiver testing (where signal generation is required), and transmitter testing (where signal analysis is required). HIL testing (Hardware in the loop), typically requires both. Fortunately, high performance AXIe signal generation and analysis modules make all of this possible. There’s a new modular instrument standard announced! It’s called “AXIe Zero”, titled “Low Cost Instrument and Switch Architecture”, and written as AXIe-0. Like Coke Zero, AXIe-0 is the diet version of its namesake, AXIe. But instead of cutting calories, AXIe-0 cuts cost and complexity. I’m going to tell you about it. But before I do, I need to give you full disclosure. I led the technical committee that designed it. So, I’m not a disinterested party. Readers know that I have opined greatly in this column; reporting the news of modular instrumentation and giving (I hope) intelligent commentary. Now the shoe is on the other hand! So, I am now going to tell you, first person, what this is all about. I am a member of PXI, VXI, and AXIe consortia. At an AXIe Consortium meeting, less than one year ago, I volunteered to lead a technical committee to reduce the cost of AXIe, so much that it could be used for electronic switching. My offer was quickly accepted (!) and the committee was formed.